In today’s highly digital era, technology is advancing and payment ecosystem is changing rapidly. Consumer demands are also evolving. Point-of-sale resellers need to invest in a perfect blend of knowledge about industry, products and smart technology competence to expand with the industry and within the target market. POS resellers who are keen about their success and look forward to the success of their merchants are keen about wants and needs. They explore the best probable solutions that bring profitability and proficiency to the target niche. POS resellers certainly need to have extensive knowledge of the products and solutions they offer. However, to be a successful POS reseller it is essential to consider your customers and their needs on top of the priority list. Having a thorough understanding of the evolving needs of customers certainly adds to your excellence. Most of the times, when it comes to selecting software, small and mid-size business owners get slightly confused thus end up researching in detail. This is mainly because of technology availability. Resellers can help them navigate the options. 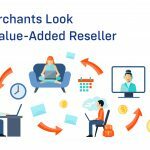 Furthermore, a good POS reseller provides insights that can aid them in finding the best suitable solution to fulfill their unique needs. Simply put, with the ability to consult with merchants and specific niche markets and tailor solutions that will meet their needs, resolves their pain points and grow their business, a POS reseller contributes a key role to add value to the buying decision. Learning is an ongoing process and this is particularly true for resellers. A truly successful POS reseller needs to keep learning and brushing up his skills. It is essential to keep up-to-date with the latest technologies and products. Furthermore, keeping up with the latest trends related to your target market is considered as an integral aspect of the learning process. Research the current trends and technologies to develop the best business practices for your customers’ niches. This will position you to assist them to make the top picks when it comes to choosing technologies for their business. Certainly, figuring out the best solution for customers is the ultimate goal. However, it is also significant to assist them with the way solution is delivered, maintained/updated and billed. It is essential to be flexible and come up with innovative ways to aid your customers in getting the right solution. Help your customers figure out the best fit for their business and this will help build ongoing relationships with your clients. Long-lasting relationships are based on the foundation of trust, so work to build a strong trust. Be a good listener first. Listen to customers, their preferences and requirements along with dislikes and then create your products, services and solutions. Understand their needs and find out exactly what their business needs. In addition to being a good listener, it is also essential to get the right information from them. So you need to ask correct questions to find out their problems. Understand their pain points and priorities. If you listen to their needs perfectly, you will be able to figure out what they need exactly. This will also help establish a strong understanding of the buyer profile. Thus it makes easy for you to integrate a solution that fits their needs and addresses their problems. You just need to listen to them and collaborate with them to address their issues. Customer’s growth reflects your growth. Successful resellers truly respect this. Making customers’ businesses grow is what makes their business prosper. Rather than just keeping an eye on what you can sell them, good POS resellers always think about how to benefit them. The benefits you are going to offer them are apparently going to help in your business growth. Always offer the solutions that will really boost your target clients’ businesses and mark a difference for your target clients. When your clients do well, they are surely going to expand and obviously, they will keep coming back to you because of the value you have already provided to them. This will surely help further your client relationships. In addition to this, happy customers spell a great source of new referrals, which means new clients, new opportunities and business growth in turn. To conclude with, POS resellers need to be on toes to be successful resellers in today’s competitive era. With the “customer-centric mentality as the prime focus, it is essential for POS-resellers, to invest time and efforts in truly exploring the needs of niche markets and display customer service mentality in an effective way. Understand their needs and opt for solutions that provide them with the expertise to expand their businesses and stand ahead in the competition. This is likely to add to your profits as well. Certainly, earning good profit through more sales is always a desirable goal of every business. However, healthy and long-lasting customer relationships are also an essential aspect to take your business to the next level. This will help create your business image and good reputation. Also, with new skills and knowledge of the latest trends and technologies will help you gain a competitive edge by offering more apt solutions to clients. Try to minimize buyer’s risk by figuring out a more apt solution to the customer’s needs. Listen to your customers and grow your accounts. So, what are you waiting for? It is time for POS resellers to be keen about all points discussed above to be successful POS resellers and hit the bull’s eye in an effective way. Get started now. Digital transformation: How resellers can tap the growing demand for cyber security?